The Federal Reserve Chairman and the US Office of Treasury would like you to establish the monetary and fiscal policies in order to increase the country’s Gross Domestic Product (GDP), reduce the unemployment percentage, decrease or stablize the inflation rate while strengthening the US dollar currency. The Economic Scoreboard and Flow Diagram will show your results after each quarterly time period. Use the pull-down tab to view each quarterly time period in the flow diagram. 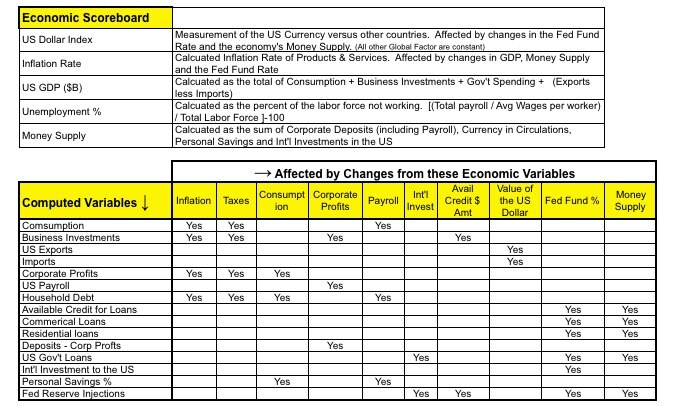 The results of your monetary and fiscal policy changes will automatically show in the US Economic Scoreboard. Your objective over the next four time periods is to growth our GDP, reduce the unemployment percentage, decrease or stabilize price inflation, while strengthening the US dollar. The amount of Money Supply in the economy is also displayed to show the impact of your monetary policy changes. You have the power to change only selected monetary and fiscal policies. Your changes each time period are cumulative. The Economic Scoreboard and Flow Diagram will be updated immediately upon entering your new time period data. Federal Fund Rate – The interest rate established by the Federal Reserve typically on overnight loans in which US banks borrow from other US banks. Currency in Circulation – The total value of US currency in the hands of the US public. Currency held in US banks is counted as deposits not as in circulation. M1 Deposit Reserve % – The percentage of a Bank’s M1 deposits that are held by Federal Reserve. Gov’t Spending Rate – The percentage growth of Federal & State government spending during each time period. Individual Tax Rate – The total household tax rate collected from income & spending. Corporate Tax Rate – The total business tax rate on each dollar of profit. Our economy begins with the US Banking System which is managed and controlled by the Federal Reserve. Each member bank [B] allocates a percentage of its deposit reserve to the US Central Bank – The Federal Reserve. The economy’s money supply consists of all banks reserves and currency deposited by US businesses, individuals and International organizations. Businesses deposit their profits, individuals deposit savings and International organizations make investments in the US via our banking network. In addition, the US Treasury can print money currency as specified by the Federal Reserve’s Monetary Policy. The money printed is distributed through the banking system as part of our economy’s money supply. The M1 money supply consist of all currency, traveler’s checks, and checkable deposits, whereas the M2 money supply consists of M1 money plus savings deposits, money market accounts and small-denomination time deposits. In summary, the money supply increases when the US Treasury prints more money and deposits from businesses, individuals and international organizations increase over time. The baseline assumption for the M1 Deposit Reserve Rate is 10% which assumes that M1 money represents 18% of the total money supply. The Fed Fund Rate is the interest rate established by the Federal Reserve for banks to loan money to other banks inside the US Banking Network. When the Fed Fund Rate is reduced by Federal Open Market Committee (FOMC), it is to encourage banks to loan out the money supply during recessionary time periods. With a lower cost of borrowing, banks can increase their bank’s capital by charging a higher rate for loans to businesses and households. However with lower interest rates, the value of US Dollar on the exchange markets may depreciated, assuming no other changes in the global exchange market. How is the Money Supply allocated in our US Economy? Financial Market – Stock/Bond Markets, Investments in Real Estate, and other markets where the investor expects a positive return. Available Credit Market – Banks and other financial intermedaries loan money to the government, businesses and individuals. Labor Force Payroll – Income checks earned by the labor force including unemployment and other entitlement income checks. The amount of available credit is based on the current prevailing Fed Fund Rate. Lower interest rates will increase the total value of borrowable funds. After business payrolls are made, the baseline assumption in this economic model is that the credit markets and financial investment markets split the balance of the money supply 80%/20% respectively. This mix allocation changes in accordance with changes in the Fed Fund Rate. The US Government demands the most credit by issuing bonds & notes to cover the cost of their deficit spending patterns. The credit markets tend to give first priority to the money demands made by the US Government. The remaining available credit can be loaned to commercial businesses and residential households. Unlike the US Government, the demand for credit by businesses and households is subject to the prevailing interest rate levels. Naturally low interest rates encourage businesses and households to borrow more. The baseline assumption is that commercial businesses and households will borrow 60% & 32% respectively of the available credit after the US Government has borrowed its share to fulfill its spending patterns. If Government spending increases in future time periods, then commercial businesses & households will also increase their borrowing. This situation assumes that an increase in government spending (Federal & State) will create investment opportunities for businesses and households encouraging them to borrow to take advantage of government sponsored programs. Another assumption in the economic model is that approximately 1.2% of the available credit is not loaned out to the commercial and residential markets for a variety of reasons. This loan hold-out % will vary with the prevailing Federal Fund Rate. The Federal Reserve is the ‘lender of last resort’ and will inject money into the credit markets by purchasing US Treasury Bonds & Notes in order to satisfy US Government spending patterns not satsified by the credit markets and/or the international investors. 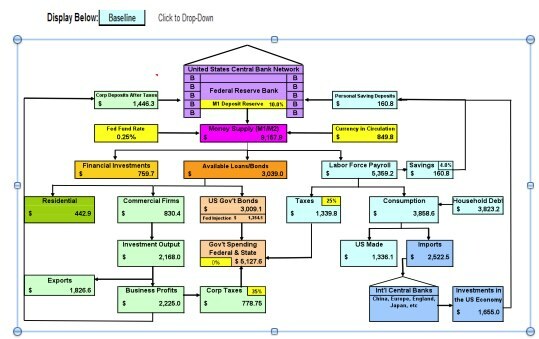 The ‘Fed Injections’ or bail-outs represented in our economy’s flow diagram is the dollar amount of funding added exclusively by the Federal Reserve when the traditional credit markets are unable to do so. The baseline assumption in the economic model is that 55% of the US Government spending patterns is funded by International Investors. The balance is funded by the Federal Reserve & other US investors as they buy US Treasuries & Notes to satisfy the government spending. US Government spending in the economic model covers all Federal and State spending programs. The baseline assumption is 0% growth in government spending. You have the option to change this growth rate in future time periods. The baseline assumption for the fiscal tax policies for corporate businesses and individual households is established at 35% and 25%, respectively. These tax receipts help reduce the total US Government borrowing via the issuance of treasury bills. You have the option to change these tax rates for corporation and/or individual households in future time periods. 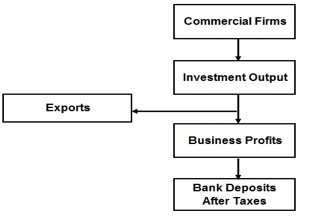 Commercial business firms produce product and services from funds borrowed and generated internally via profits. The total value of this investment output is affected by the economy’s inflation rate and fiscal tax policies for businesses. In addition, business investments are affected by the growth of available credit which is linked to the economy’s interest rates. The combination of inflation, corporate taxes and available credit will automatically adjust the baseline value of business investments . Exports are a function of the value of the US Dollar. As the US Dollar get weaker against other global currency, ie the US Dollar Index is reduced, then business exports increase due to the low price in the global marketplace. Business profits before taxes are affected by the economy’s inflation rate, fiscal tax policies for businesses and change in household consumption. The combination of inflation, corporate taxes and household consumption will automatically adjust the baseline value of Business Profits which is the net value of revenues less costs. All profits after taxes are assumed to be deposited in the US banking network as part of the economy’s money supply. Payroll income checks are generated from bank deposits made by commercial businesses. This income is taxed according to the tax rate established by the federal and state governments. The baseline assumption in the economic model is that household income is taxed at 25% which includes all income taxes and personal sales taxes. The individual saving rate is based on after tax income and the baseline assumption is that households save 4% of their after tax income. These saving $s are deposited within the US banking network and become part of the economy’s money supply. Household consumption is the remaining balance of income after taxes and personal savings. The value of household consumption is affected by the economy’s inflation rate, individual tax rate and the change in payroll income. As these economic factors change, the value of household consumption with change accordingly in this economic model. Whereas household debt is the additional comsumption purchased on credit. The sum of household consumption and debt represents the total consumption included in GDP. Household consumption consists of products made in the US and imported products. The value of imported products purchased by consumers is affected by the change in the US Dollar Index. A lower US Dollar Index will reduce imports and increase exports, and vice versa. The value of US made products is the balance remaining after imports are subtracted from total household consumption. The total value of products imported into the US feeds the International Central Banks around the world. Consequentially, these international central banks often make investments in the US by purchasing US government bonds and notes. Their investments are deposited in US Banks which feeds the economy’s available credit markets and financial investment markets. 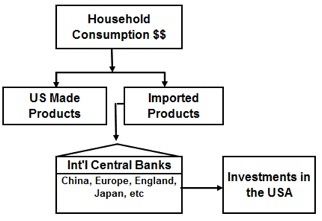 The baseline assumption in this economic model is that the International Central Banks contribute 55% of the US government’s borrowing. If the Fed Fund Rate increases (ie. higher Bond Yields), then the International Central Banks will increase their investment contributions to the US, and vice versa.